"Just because a cat crawls into the stove and has kittens, it doesn't mean that they're biscuits!" November 26, 2007 - GONE, GONE, GONE! In May, we'd written "Looks like you missed your big chance to get involved with the group that was going to change the face of Freemasonry as we knew it. No, not the Modern Rite of Memphis. That's SO passé and no, not the Rose Cross of Gold which has now had more metamorphoses than a yard-full of caterpillars. Nope, we're talking about missing your big chance to get involved with the grandiosely titled "United Grand Lodge of America". And, it seems, we were right - or at least until a couple of blinks of the eye from now when there will be something else on the plate. Following a US Thanksgiving long weekend, we returned to find that ALL of the several UGLA websites were converted into link farms. They've since been redirected to yet another 'organization'. Why? Well, they're now something different - or maybe they're the same. In reality, one person who seems pathetically desperate for attention has now (because everyone wouldn't follow his rules) gone off and formed YET ANOTHER group: the GRAND ORIENT OF THE UNITED STATES OF AMERICA. You've just gotta love it folks. Internet rumors had the UGLA leadership (perhaps two other guys) breaking with the organization's founder as he immersed himself into the internal affairs of a lodge in Ohio and the rumors seemed to be supported by a resurgence of activity for a brief while on the RRCG website. However, November 26th finds all of the UGLOFA.ORG websites now appearing as 'link farms' (those places where someone has bought the domain name and simply puts a page with a few links there to keep traffic coming and, hopefully, prey on the unwary by sending them to places where they perhaps shouldn't be going). Is this because the UGLA founder is piqued at them? Who knows - and certainly it could be. He who controls the domain on the web can control the appearance of things to the unwary. Too bad too: just when others were starting to wonder what happened to the many lodges formed in January, 2006 including Deep Blue Current No.8, Miami, Florida, Alexandria No. 9, Augusta, Georgia, Anderson No. 10, Mobile, Alabama, Rose Croix No. 11, Lawrenceville, Georgia, Prince Adept No. 12, Atlanta, Georgia, and Solomon No. 13, Montgomery, Alabama. Just when the Vulcans (see below) were beginning to gurgle about the group. Ah, what a shame.... Stay tuned, though: there'll be something new before you can blink an eye! Oh, and by the way: our 'announcements and predictions' box here is going to be kept so that you can see how accurate we've been in our claims about these folks. We're saving each of them on a page titled "Told Ya So"..
Maybe you bought a DVD of a just-released film at a very low price only to find out that it was really filmed by some guy with a hand-held camera in the front row of the theatre. Perhaps you bought a pair of sneakers with that well-known logo at a remarkable price only to find them falling apart after a couple of weeks at which point you realized that the logo wasn't really the logo you thought it was and those sneakers were just a cheap knock-off. This is similar to the situation you may find yourself in should you choose to associate yourself with any group that is unrecognized by the world-wide fraternity known as Freemasonry. Their 'pitch' sounds good and uses all the right buzz words which will appeal to your desire to learn the mysteries of life. In fact, even members of regular/recognized Masonic lodges can be seduced by the rhetoric that's involved. The United Grand Lodge of America is not/was never a regular or recognized Masonic body by the standards of the world-wide Masonic fraternity. While they may wish to convince you that they are (to abuse the phrase 'More Catholic than the Pope') more Masonic than the Masons, they simply aren't. Period. Full stop! There is no Grand Lodge of America in regular/recognized Freemasonry. The idea was suggested to and abandoned by very nearly all state Grand Lodges in the 1840s. That was more than 160 years ago so there's been enough time to get one going if anyone was really interested. It isn't likely to ever come up again in the lifetime of anyone reading this page. Still further, such discussions were amongst regular/recognized Grand Lodges only: not just any group that decided to call themselves a Grand Lodge and pretend that they were Masons. The several websites for this group have, as of January 2007, gone to 'private identity' status so no one will find out who's behind them. Why? Even more comical, as of April, 2007, all but the UGLA website is now hidden behind password protection. That's one pretty unique way to solicit inquiries! And of all their supposed members in their many lodges, not ONE - curiously - seems to be internet-savvy enough to post on a message board, create a website, or even send an e-mail here proclaiming their proud existence. What does this tell us? This site's webmaster does not make the rules that Masons use for recognition. Anyone who alludes snidely to that is not only being puerile but is trying desperately to obfuscate the issue. What's "real" and what's not? You might have seen the UGLA website proclaiming themselves as 'the real deal' complete with pictures of and quotes by historical figures who were Masons along with others of those who were NEVER associated with any Masonic movement but whose name they decided to associate with themselves. You may have read blog or discussion group posts talking about 'ancient' versus 'modern' Freemasons giving the impression there's some sort of rivalry going as with Coke versus Pepsi. You might have even seen a half dozen blogs all repeating each other with identical rants about what they've deemed 'ancient' Freemasonry. Apparently they feel that if enough anonymous websites and/or blogs (plus the one that uses his real name only because we 'outed' his childish sock puppet) repeat their claim, it then it surely has to be true. Oh, and this stuff about "Free-Masons" (free hyphen Masons) is a bunch of hooey too. It means nothing. They've tried to set themselves apart with a hyphen: that's all. The former "Modern Free-Masons" site is now simply a redirect to the UGLA site.... You really do want to read the "rights": can we spell 'anarchy', folks? Oh, and these so-called "Modern" guys have a Constitution that's new and up-to-date as well, copied from the Grand Lodge of England in 1721. That's right: 1721. Pretty modern, don't you think? Every lodge is independent. 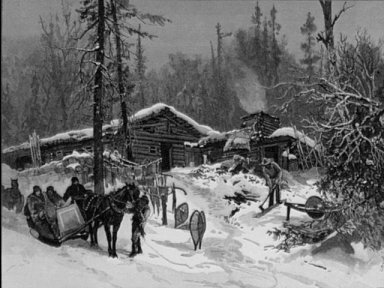 Every lodge makes up their own rules to do as they wish. Isn't it great? Why, then, have a so-called 'Grand Lodge'? (Well, to be fair, they said it would only meet once a year. In reality, we think they meant "only once ever"!) Of course, if every lodge can do what they want, when they want, and how they want to do it, without consequence, the logical problem would (have been) if they ever get three lodges together, there's nothing to say that #1 will have anything to do with #3. Talk about 'confusion in the temple'.... errrr.... coffee shop! You should take note too: several blogs have been VERY supportive of this organization. Who writes them? Who knows - since they're all so proud of their affiliation that they feel the need to hide behind pseudonyms. They have all, somewhere along the trail, written that they're not members of the UGLA however. If that's really the truth, why do they promote it so zealously and yet not join? If it's as great as they claim, you'd think they would have certainly become members before writing their breathless praise - just so they'd know what they were talking about. These bloggers also seem to spend inordinate amounts of time with slur and slander against the 300 year old fraternity of Freemasons. Just sport, perhaps - or maybe more obfuscation. If they aren't members, how do they know how great the group is? If they really are members and too embarrassed to admit it, that should tell you something too. The Sublime Council issued a statement on Saturday reminding all brothers that secrecy and discretion are essential to the future of Freemasonry in America. "Each of you must be bound by the cable tow of absolutely secrecy regarding the Rite of the Rose Cross of Gold and your brothers. The Grand Lodges are being controlled by other forces and will bring harm upon the brotherhood if directed to do so by THOT. True Freemasonry must still be practiced with absolute secrecy even in the 21st century. Three-hundred years ago our brothers feared Papal Bulls, today we must fear the Edicts of controlled Grand Masters." Secrecy is essential to the future of Freemasonry? How utterly absurd - but maybe that explains the shenanigans of this group! Sounds more like a dictum issued by the kid in whose yard the tree house is built, doesn't it? The RRCG was first part of something called a "Sovereign Sanctuary" whose site history was reportedly blocked from view by the site owner. Back in 2005, you had to be a Master Mason in good standing (they said that the Rite does not confer the three Symbolic Degrees or make Masons) with a preference given to members of the Scottish and/or York Rites ("...we would hope that you are a supporting member of both." and live in Georgia or Washington D.C. Of course, that didn't last long. Oh, and you also needed to have membership too in the "Collegium Fabrorum" which, it was asserted, was a separate group having no ostensible connection to them. (See here for the other requirements.) That site had been dead for some time and was curiously resurrected as well in May, 2007. Then during 2006, its website showed it as a lodge under the United Grand Lodge of America, continuing through January, 2007. 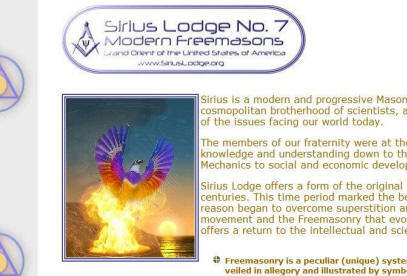 On February 4, 2007 a new domain name was purchased (anonymously) and suddenly there was "Sirius Lodge" on February 7th. It would seem that you can add a LOT of organizations to your resume if you stick around for just a little while with them! But here's what was happening: the creator of all of these groups was apparently repositioning them! On May 17, 2007, the RRCG 2006 website returned which required college degrees for membership, offers - because of their hilarious claim of 300% to 400% growth (perhaps per millennia!) - to buy old Masonic buildings, and glowing praise from the likes of Tim, Scott, Richard, Kevin (who says he was deceived by his 'brothers' - presumably real Masons - and the Grand Master), Hank, John (who thought that Hank was a Grand Lodge spy) and Alex who was sending in his $500 check in the morning. Apparently none of them were proud enough to have their surnames used NOR has anyone with any of these names been heard from since. Amazing how they were able to post their comments then and just lapse into 'silence and secrecy', isn't it?. Oh, and then there's the 2006 visit to Rosslyn Chapel so touted by them and yet, curiously, never mentioned anywhere on the internet afterwards by the 'usual suspects'. Seems as if it's now on for 2008 but we're not holding our breath. You can't make this stuff up, folks: it is SO laughable in the REAL world! 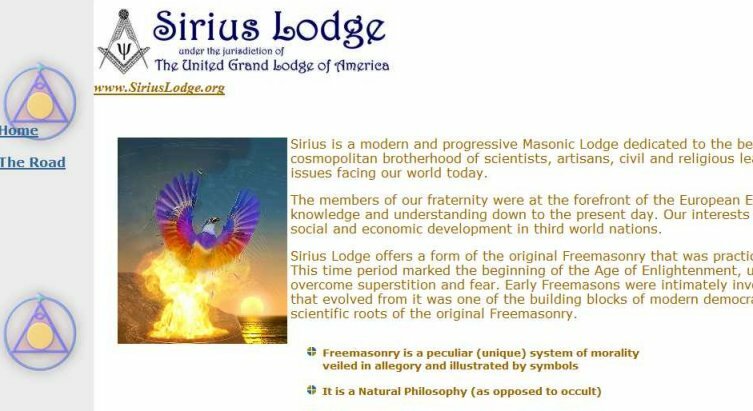 So now (don't blink: it might be different) there's the Sirius Lodge two page website which links to the RRCG website that in October 2007 claimed they were building a building. The location seems to have been left unmentioned. We wonder why.... (Remember that they wanted to buy and save old Masonic buildings? Times change in a few months it would seem.) Their website even has two pictures (looking suspiciously like something created with Corel Painter or some other drawing program) of the completed work and two of the unfinished rooms. They also bragged that they were going to be making 3 apprentice masons in November but now a month after the event, they've apparently been to very busy to brag any further about either building OR membership. Yep: three new members - a pretty big announcement for a group claiming to be the fastest growing Masonic organization in the world. Heck, the lodge I belong to is scheduled to take in five in just this month alone and maybe there'll be more! And that's ONE LODGE in ONE JURISDICTION in ONE COUNTRY. But let's face it: if you have one member and you take in three, then you really ARE the fastest growing, aren't you? November 17, 2007: As we've said, DON'T BLINK! Now Sirius is Sirius #7 has an announcement made by someone whose name has never been seen online before claiming that the RRCG members are going their separate ways from the UGLA/Sirius crowd due to their (the RRCG's?) religious convictions! So let it be written (even if by a sock puppet) ~ so let it be done! 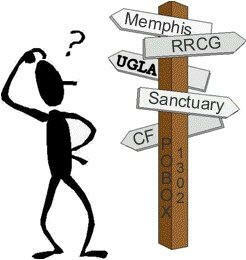 And what about the RRCG? Formed somewhere around 2004, in January of 2005 the founder and "Past Sovereign Grand Master of Light" Mr. Jeff Peace, declared the RRCG to be DEAD!!! See it here, folks.... Then, when (according to internet rumors) Mr. Peace's United Grand Lodge of America couldn't stay together, there was a brief resurgence of interest in the RRCG including - hold your hat - building a building and brave announcements about accepting apprentices. Of course, it's now 2008 and you can learn of their NEW 2007 Masonic education program. Perhaps you shouldn't hold your breath for the 2006 2008 trip to Rosslyn either. Meanwhile, the announcement about the so-called Grand Orient of the United States has occurred. That little whiplash graphic above: now do you know why it's there? And is THIS a better Masonry than Masonry? Really? Oh, my gosh - yet ANOTHER change! 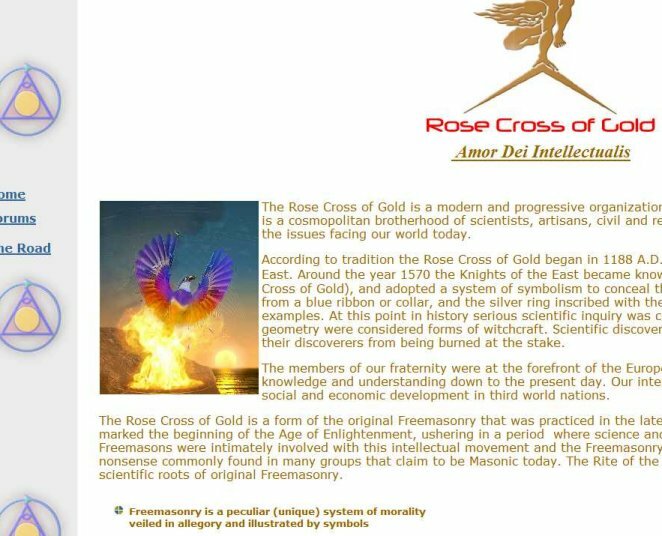 On March 20, 2008, they abandoned their black website and now have "Rite of the Rose Cross of Gold - Lodge Sirius"! This is just TOO comical. So what happened to the candidates they had in October, 2007? Guess we'll never know, will we? And what was particularly comical was that - once again - these highly intelligent young guys screwed the coding of the site all up. It was pretty funny to see. We think that having the RRCG web site sitting out there collecting dust was just too embarrassing so now it's morphed into a 'combined entity'. SO, better get on board fast or the train might leave the station without you! So who cares - and what does this all mean? Regrettably, some people looking around on the internet for information about joining Freemasonry will - being unfamiliar with the titles and organization of this and other similarly-situated organizations - think that this might be a great way for them to get involved. After all, they don't want to be part of a group of 'fudie-dudies' or old men (even though most Masons will tell very compelling stories about how the generation gap is usually quite transparent within the organization). The prospect might even talk to the persuasive and personable (and sole?) contact person , becoming mesmerized by his compelling oratory about the 'true virtues' that their group has and which regular and recognized Freemasonry has lost. Someone might even think that it's really better to join a Grand Lodge of the United States rather than the Grand Lodge of Nebraska or California, not realizing that their membership in the United Grand Lodge of America will NOT make them Masons as they wish to be - nor will they be allowed to visit lodges in those many buildings in their state and across the United States bearing a Masonic emblem. And one other point about the obfuscation: while the term "Brother" is normally used amongst Masons (and monks! ), the couple of fellows who flog this group around the internet have no compunction about using that term to identify themselves even though they are not - by their own admission - members of a recognized Masonic body! Their founder, in fact, has regularly used the identity of his former (regular/recognized) Masonic Lodge in online forum postings despite the fact that he has been totally and completely removed from membership there. Curious, isn't it? Even more curious are their listing of 'Rights': is it just me or is there a very large amount of verbiage alluding to bad behavior and the results thereof. Perhaps they're anticipating....??? Be aware also that after one joins an unrecognized group that holds itself out as being Masonic, it is MUCH more difficult to subsequently join a regular/recognized Masonic lodge. Does this organization have any credibility except amongst their own membership? They formerly argued that the Masonic Commission on Information for Recognition took notice of them just a couple of months after their formation. This blithely ignored the fact that the sole purpose of the Commission is to notice all sorts of bogus groups who use the name of Freemasonry. This claim was dropped from the first iteration of their 2007 website - probably because we noted here just how silly it was. And finally there are the historical contradictions: they want you to believe that this group is somehow "modern" while the rest (that other 5 million that are out of step) are "ancient". These terms, for Masons, hearken back to the past history of the Craft but they've got it completely backwards (there was a newer group who called themselves the "Antients" back in the late 1700s). Moreover, the distinctions then were about one thing: ritual! Not the supposed 'old-fashioned ways' that these few are rebelling against after being forcibly removed from Freemasonry. Can anyone spell "Sour Grapes"? He trusts his own visions. He obeys the attractions of an interior voice, but will not listen to other men. He identifies the will of God with anything that makes him feel, within his own heart, a big, warm, sweet interior glow. The sweeter and warmer the feeling, the more he is convinced of his own infallibility. such a man can wreck a whole city or a religious order or even a nation. The world is covered with scars that have been left in its flesh by visionaries like these. Moreover, that rant had the bizarre assertion that this website has somehow fostered vigilante actions by an unknown party or parties (which, from the post could logically be assumed to be a Mason spurred on by this website) against the UGLA founder's wife. It's strange: even in log cabins in the woods you can get caller ID AND there's a police force here too. Don't they have such things in the Atlanta, Georgia metroplex? Apparently not or else why wouldn't this ostensibly persecuted individual who is such a well-versed user of modern technology have such a thing? Why was there was no mention of this until a year after it supposedly occurred? A website causing people to threaten your wife and you just take it in stride? That's pretty cavalier - or pretty untruthful. For the record: I would NEVER EVER condone action of the type described. Every other piece of information in that post is also fabricated. A couple of years ago the same individual wrote to a Mason who's active online claiming that the masonicinfo.com website was causing his supposedly PREGNANT wife so much distress she was going to leave him. So what happened? Nothing! They still, reportedly, take motorcycle rides and this site hasn't changed. Isn't this pathetic? You are free, of course, to consider my marginalization of such seemingly horrific claims as being too rash: after all, why would anyone lie about something like this? Perhaps it's true that the claimant has some problem with getting/using the caller ID option that about 90% of the rest of the United States relies on. Still, why would he lie in claiming that I've been subjected to multiple lawsuits, or that I live on a dirt road, or that I know what goes on at (supposed) meetings in Vermont, and (the one that was particularly hilarious) that ex-wives were saying bad things about me. Do any of these things (all lies) have relevance to what's written here? In December, 2006 came the claim that I might be revising a self-serving Wikipedia entry on this organization. Well, just for the record: I have never - not once, ever! - made an entry to Wikipedia or any other Wiki - before or since! I don't know how it's done nor do I have the time or inclination to learn. Attached to that whiney post was a complaint that I hadn't updated my blog for some time. Yeah? So? I'm not trying to gain membership in a make-believe national group like the one doing the complaining. Of course, it's all sour grapes because with the activity on my blog, they were embarrassed to learn that I was using that technology LONG before them. What technophobes, huh? Hey, fellas: at least everyone knows MY name when I do blog! I don't hide behind pseudonyms or pretend that I'm not a member of something in order to make people believe my posts are credible. As of February, 2007, their self-aggrandizing Wikipedia entry had been removed. The BIGGEST ongoing whine seems to be that I'm unwilling to talk with the group's founder. The assertion is that if somehow, by just having a conversation, all of my concerns about this and the several predecessor groups will suddenly dissipate. Wouldn't it be wonderful? The light of truth would shine forth and burst through the clouds of my confusion.... <sigh> It's wonderfully easy to write lies on 'friendly turf' without fear of challenge and it's all the better when one can get their 'attack dogs' to lead the demonizing of Ed King. From time to time too, I receive comments that I "misunderstand" the person who's been so instrumental in all of these groups and that he really has some good ideas. I also see a few (now down to a 'handful' at most - a SINGLE handful!) of otherwise sensible Masons saying that it's ok if someone wants to start their own Grand Lodge. Heck, there have even been a couple of Masons write that by (supposedly) keeping this group (or any of its several predecessors) down, Freemasonry itself is being hurt. Masons are supposed to be tolerant so why not tolerate this? To all of that I say, "Baloney!" Simply because someone writes a breathless essay about Masonic morality does not give them the legitimate authority to speak for Freemasonry OR to define for others what Freemasonry should be. Because they 'teach' others that there are supposed 'hidden secrets' about Freemasonry's formation that have never before been revealed doesn't make them a 'renown historian' but rather a good <baloney> artist. To whine that 'Ed King doesn't make the rules' and then immediately write yet another essay or forum message on what THEY say the rules ought to be seems absurd but it happens all the time. I've stood up to say that the Emperor has no clothes and because of that, the 'attack dogs' are unleashed to cast me as the devil or - worse - the 'mouthpiece' of some Grand Lodge - an odd conundrum since they claim they don't care what Grand Lodges think in the first place....! Well, it is to laugh. Dear readers: because one person claims that the Grand Jurisdiction under which they held membership is bad, unresponsive, evil, or whatever, doesn't mean that this really is the case. Truthfully if I belonged to ANY organization that I thought was as bad as this couple of these fellows think Freemasonry is, I'd be LONG gone. Why do they hang around, constantly reliving their supposed past slights and insults, whining about the awful way in which they were expelled, and trying to convince everyone that they were just poor, innocent victims? What purpose is served by their wallowing in self-pity? Why try to create an organization that mimics the one they hate? Why not just move along and join the Elks or the Rotary (if they'd have you) or the local Starbucks esoteric discussion group. Why the compelling, obsessive need to prove that they were right and 5 million others were wrong? And it's also curious that those who've taken up the standard for the self-styled United Grand Lodge of America (and more especially for its originator) ultimately wind up 'getting bit' - and often, bitten badly. When online Masonic Forum administrators have asked him for temperance, he responds mercurially with insults and profanity. By all accounts, if you buy into his line and drink the Kool-Aid 105%, then he's the greatest fellow in the universe but if you deign to question at even the most innocuous level, you're suddenly nothing more than a dust mite. Exaggeration? Check around - or try it yourself! Those who've followed this dance for a while are sometimes reluctant to admit that what's written above is correct: they'll find rationalization for the vindictive and hateful behavior or pretend that it's insignificant. In the dead of night, though, they know in their heart of hearts that I've hit the nail on the head! More than one has publicly admitted just that. Probably the most troubling thing in all of this is a pattern of behavior that really isn't - by ANYONE'S lights - Masonic at all. There's no need to hide one's identity when involved in Freemasonry: the concept of "secret masters" is really the stuff of kid's games and is not only melodramatic but it's also quite unmasonic. Meeting 'on the level' doesn't mean we use made up identities and swarmy screen names. With the earlier groups referenced above, there was sometimes a claim that esoteric tradition is to hide one's 'real world' identity. That's nothing more than smoke and mirrors to hide the fact that those who are involved with this group are - clearly - just too embarrassed or ashamed to admit it! They know they're doing something wrong and they want 'culpable deniability' - even though they'll bray that they're doing the right thing all the time. Update: August 2006 provided blog postings complete with a picture of the SEVEN - out of the claimed "many" professionals who are members - who were convinced to have their picture taken without caption of identity. Despite the rants about racism in Freemasonry that the UGLA supporters have mounted (only, it seems, because they thought they could get attention in an election of a governor), we failed to see a single Black, Latino, or any other ethnic minority in that picture. It was all just lilly-white males! Apparently none of those corporate CEOs, doctors, lawyers and educators who's an ethnic minority had the time to attend this very important Grand Lodge meeting. How very odd. Perhaps there were only 8 attending - something which also speaks to their legitimacy! We note too that their claim regarding this large professional membership was dropped from the first 2007 iteration of their website. Why was that? We've watched internet "sock puppets" (secret identities created simply for deceit and obfuscation) come and go. In one instance on the usenet newsgroup alt.freemasonry, when the individual behind these posting identities was caught 'flat-footed', his rationalization was that Ed King (this site's owner) was bad and that their goals justified the lies. In addition, we've seen claims made about this group's "affiliations" with charities and Masonic organizations. There was a claim by one of the predecessor groups (the 'Modern Rite of Memphis') that the Order of DeMolay - a youth group sponsored by Masons - was their 'charity'. Investigation revealed that DeMolay officials had never even heard of MROM or its plans. 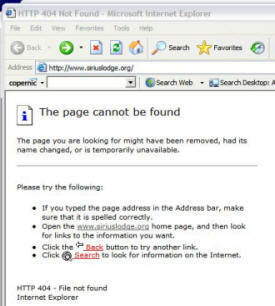 So why does the United Grand Lodge of America's claim support of various charities on their website? Perhaps you may want to ask for proof of their 'support' - and then check its validity! When we first wrote castigating the bogus "Regular Grand Lodge of England", we were even offered help in 'exposing' them by the individual singularly identified with the United Grand Lodge of America. Such behavior seems to follow a previously established pattern: 'the enemy of my enemy is my friend'. In fact, this behavior has manifested itself in some VERY bizarre ways involving this website author's personal life but we'll discuss THAT further in due time. Suffice it to say: even those most supportive of this foolishness will likely find what has happened to be troubling at best. When you drink from the water, remember the source. It's true that ANYONE can have good ideas - and that membership as a Mason is not a requirement for that. It's also true that ANYONE can have good ideas about how a lodge or Grand Lodge can/should work. Heck, most Masons get plenty of 'good ideas' from their wives at the dinner table on a quite regular basis - and sometimes we're even bright enough to go back to lodge and put those ideas up for consideration! It's our personal belief, though, that an individual who apparently had never had the mantle of leadership of even his local lodge (despite ostensibly having been a member for nearly 20 years before his 'erasure'!) 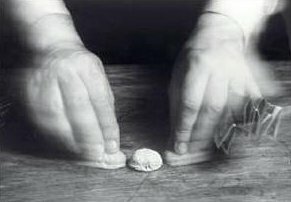 and who feels he knows 'just what Masonry needs', is pretty unlikely to have the wherewithal to make that a reality single-handedly or even with the help of a handful of nameless and faceless others, particularly while telling egregious lies about those who have a contrary opinion of the fruits of his labors. When someone who has served their lodge as a Master and in several other positions, has worked at a District level to understand more than his own little sphere, and who has served on a Grand Lodge committee or three so as to get the perspective of what a jurisdictional-wide entity needs for unity and cohesion: when that person speaks about problems they see in Freemasons and Freemasonry, it might be worth listening for a while. However, when someone who's never even gotten to be a 'local club president' starts whining that a international organization with over five million members is out-of-step with his couple of followers, you've really got to wonder if there just isn't something wrong. And that ol' whine that 'everybody is out to get him (them)' does get awfully old. Bottom line: websites castigating every other Grand Lodge and claiming THEIRS is the best certainly don't speak very well for the "friendship and morality" of that organization - in our humble but considered opinion, phone calls you might have with one individual notwithstanding! PLEASE READ THESE LAST TWO PARAGRAPHS CAREFULLY! From an larger perspective, all we ask is that you understand that this self-styled organization is not recognized by Freemasonry in ANY way and that if it was your intent to become a Mason, the United Grand Lodge of America does NOT provide that opportunity in the regular/recognized sense, despite their claims to the contrary and their arguments dissecting the history of Masonic degrees. Should you join the UGLA or any of the other organizations listed in the Fake Masonry section of our website, you will probably think (and the proponents of those organizations will tell you) that you can then call yourself a Mason. The sad fact is that you will never be recognized as such by the world-wide fraternity of Freemasonry nor will you be allowed admission to any of its lodges. Further still, such membership might be an impediment should you later decide you had made the wrong choice. Got some money to throw away in the hopes of having a better cup of coffee at their Starbucks meeting? Go for it! "Expelled Mason": Those involved with the United Grand Lodge of America like to say - as if it were their 'badge of honor' - that we're in error in using the term 'expelled'. Their assertion is that they were "erased" from membership without a trial. Of course, from a "reputable" source - the (then) Grand Secretary of the UGLA - there were only TWO individuals who were "erased".... Read it yourself here at the bottom of the page. It's semantics, folks! While SOME inappropriate actions by a Mason dictate that a member be 'brought up on charges' and given a trial with (in most jurisdictions) the right to legal representation, when a Mason attempts to create a group that is 'an imitation' to Freemasonry, their behavior can be reasonably seen as unworthy of continued membership. Accordingly, a Grand Master has not only the ability but the requirement to act for 'the good of Freemasonry'. In doing so, he may issue edicts that - unless overturned at the next Grand Lodge communication - become 'law'. In this case, that's what happened. Those involved with these spurious groups were told to 'knock it off' and to renounce their affiliations but instead chose to ignore the Grand Master's edict. They paid the price and are now in exactly the same status as an expelled Mason. They're off the rolls and cannot claim membership or its benefits. 'Erased' or expelled: it's a distinction without a difference. Don't be misled! And, of course, as things always change with these kids, you may be interested in one of the many anonymous blogs written by a member of this group whining about their - wait for it - EXPULSION! If we've written it, it's wrong but when it's written by them, somehow it's right. Read it here. You'll find the logic impeccable: 'We started something without permission and you, Grand Master, are all at fault because you didn't make it work.' Some days I think that it can't get much funnier - but it does! "Secrecy and Discretion are the Watchwords of a true Brother"
or, in another form, "Secrecy and discretion are the watchwords of every true Free-Mason." Don't fall for that baloney! It's a made-up slogan to try and convince you that there's something going on that you don't hear about. and no, it's not from "continental Free-Masonry" either! It's the flim-flam man - the three card monty game - the ooogaaa-booogaaaa that will make you think that it's the 'real' deal when it's nothing but an internet website that is just like the Nigerian scammers. The boogey-man approach is, sadly, so much of what the people who crank out this foolishness are all about.